Hello again! Thanks for checking out this 4th post in our series on using mobile marketing to promote your small business! Many of the topics we discuss apply just as much to a medium or large business, but we try to focus predominantly on small businesses. Please be sure to check back, subscribe to our RSS Feed, Like Us on Facebook, or Follow Us on Twitter to catch all of the upcoming posts in this series and posts on marketing your business. If you don't have time to check these sources, you can catch our weekly roundup every Saturday, or Subscribe to our Podcast that summarizes our posts for the week. Hopefully you watched the whole video above to see that I compare Nike's mobile presence on the iPad and a smartphone, as well as the Shults Group's mobile presence. They both do some things really well, and some other things not so well. One thing you'll notice is that both mobile sites use a very common drill-down technique for their mobile sites. The idea here is to minimize options on the screen for mobile users because they are generally dealing with a much smaller screen. Both did this well, but the Shults Group's 2nd and 3rd level of options were too small for finger navigation. With most of the new smartphones relying on finger input, the links really should be much larger. Nike had a great process (I like the smartphone process better than iPad) for drilling down, but when I finally made a decision to click the Buy button, they blew it! 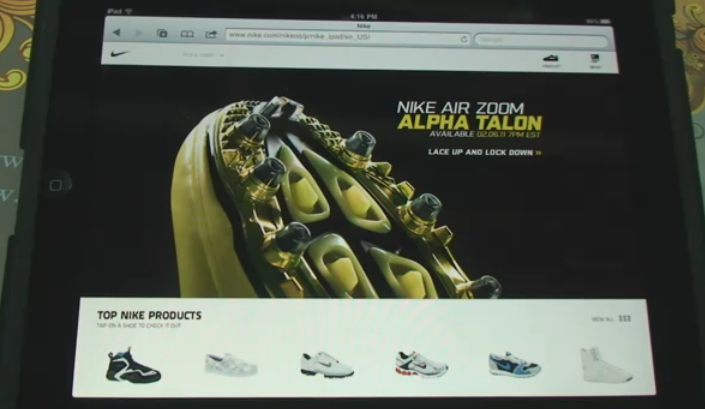 It redirected me to the Nike Store Site homepage, not the specific product page that I looked at. That was frustrating. Then, I had to find the product again and the navigation was not finger friendly. This REALLY surprised me. If you are going to screw up a part of the process, don't let it be the part where the customer wants to buy for heaven sakes! Thinking about going mobile? Maybe wondering if you should bother? Give us a shout! We can help you make the decision and get you started the right way. As always, your comments are welcomed as well!